Ski-mountaineering in Gressoney has many different forms of expressions: from multi-days trips on the glaciers, in the tracks of the legendary Mezzalama Trophy route, to one-day trip, thanks to the Gressoney's lift, climbing one of the amazing Rosa's peaks or descovering our lateral valleys. During multi-days trips you can be best guests at our beautiful City of Mantova Refuge. The price covers: the support and the assistance of the guide. Not included: skipass, lunches and transfers. 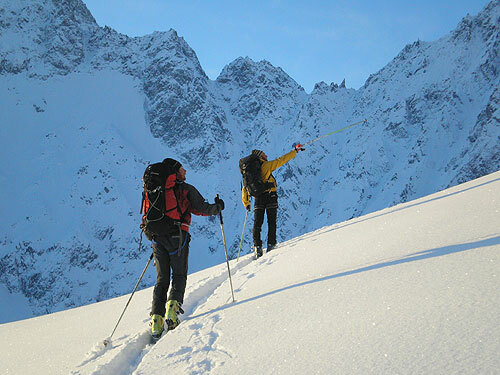 Compulsory equipment: ski touring skis and comfortable ski touring shoes (can be rented), climbing skins. Compulsory security equipment: avalanche transceiver, shovel and probe (harness if necessary) available from the organization. Possibility of daily or several days ski touring in all the Aosta Valley, high Piedmont and Canavese Valley at the same conditions as above.